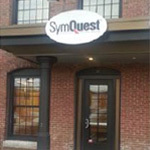 SymQuest is pleased to announce that on November 1, 2014, we relocated to our newly renovated and expanded offices across the river in 3,000 sq. ft. of Lewiston’s Bates Mill complex. This move will allow us to accommodate more employees to service your accounts and the growing business needs of your friends and neighbors. Though we will be moving in immediately, no move would be official without a chance to invite you, our valued clients, allies and supporters into our new offices to join us in celebrating. On November 12, 2014, SymQuest will officially announce our reopening in Lewiston with an open house. I am pleased to extend this invitation to join us for food and drink supplied by our new neighbors, Fish Bones American Grill and Baxter Brewing Co.